Leave your worries behind and set foot into in the sun kissed sands of Jamaica. Large master bedroom with spacious separate living room, balcony and panoramic vistas with large master bedrooms with a king sized bed and a comfortable sitting area. Amenities: Air conditioning, ceiling fan, daily fully stocked mini-bar and nightly turndown service, iPod/MP3 players and satellite cable, flat screen LCD TVs , bathrooms with a shower or bathtub, cozy bathrobes, Gilchrist and Soames bath products, a salon-style hairdryer, in-room safe, coffee maker, iron and ironing board and telephone. Enjoy a pristine view of the Caribbean Sea from your private balcony or patio only steps to the sand and sea. In addition to the standard amenities, bathrooms include large Jacuzzi tubs, walk-in shower, and a separate living room. Rooms with large master bedrooms with a king sized bed and a comfortable sitting area. Amenities: Air conditioning, ceiling fan, daily fully stocked mini-bar and nightly turndown service, iPod/MP3 players and satellite cable, flat screen LCD TVs, bathrooms with a shower or bathtub, cozy bathrobes, Gilchrist and Soames bath products, a salon-style hairdryer, in-room safe, coffee maker, iron and ironing board and telephone. Spacious rooms with covered seating area and captivating views of the Caribbean Sea, with large master bedrooms with a king sized bed and a comfortable sitting area. Enjoy a breath-taking view of the Caribbean Sea from your large private balcony; relax in your spacious, beautifully appointed living room. Rooms with large master bedrooms with a king sized bed and a comfortable sitting area. 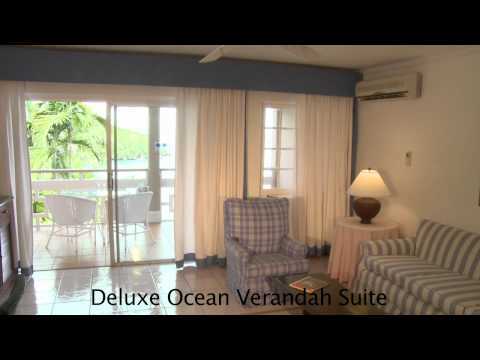 Spacious master bedroom suite boasting a large balcony overlooking Caribbean Sea with large master bedrooms with a king sized bed and a comfortable sitting area. 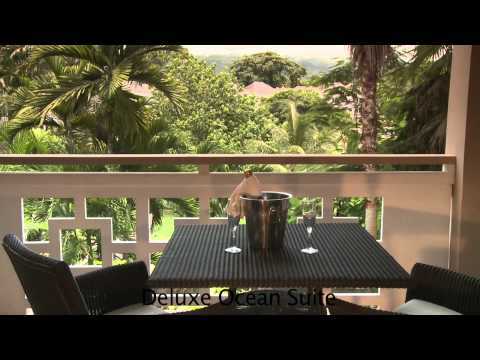 This resort is located in Ocho Rios, Jamaica. Located 63 miles/102 kilometers from Montego Bay Airport. Leave your worries behind and set foot into the sun kissed sands of Jamaica. Nestled in stunning Ocho Rios, Sans Souci emerges majestically from the cliffs of Jamaica`s emerald mountains and envelops you into a world where worries disappear and romance prevails. From the saxophonist that starts off your private, beachside dinner for two to a walk hand-in-hand along the winding, stone pathways to the hidden Jacuzzi and mineral springs grotto - there truly is romance to discover at every corner. And of course, amidst the tropical elegance and breathtaking ambiance, you`ll find the unparalleled spa treatments, renowned cuisine and first-class service you`ve come to expect from Couples Resorts. Placed in the Top Ten for Service in the Caribbean by Travel and Leisure Magazine. Situated on a breathtaking hillside to sustain spectacular ocean views from each of its 150 suites, Couples Sans Souci is a lush tropical paradise. The suites feature French or sliding doors leading to private, furnished patios or balconies. Tastefully decorated in shades of royal blue and cream, accented by island artwork and accessories; these classy air conditioned accommodations feature king beds, ceiling fans, iPod/MP3 players and mini-bars. All rooms and suites have plush terry robes, Gilchrist and Soames bath amenities, hairdryers, showers or bathtubs, coffee makers, iron/ironing board, safety deposit box and nightly turndown service.